At KGOU, we’re always looking for new ways to deliver meaningful news stories and reliable information. So, we’ve launched a new feature - our weekly email newsletter, Wavelengths. 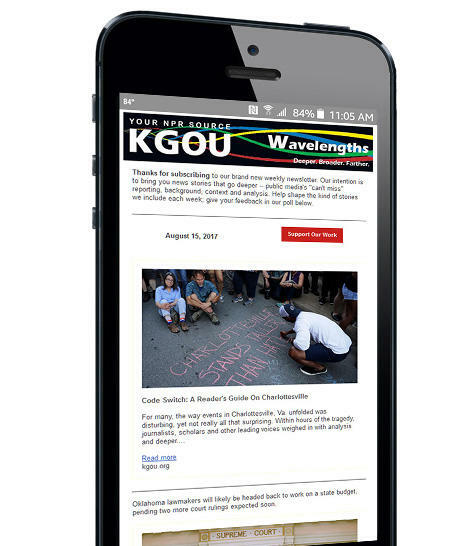 KGOU’s Wavelengths newsletter will take you deeper into some of the top global, national and local stories of the week – by providing context, analysis and additional resources. Wavelengths is designed for discerning News Junkies who want to learn more about their world. So, now KGOU and NPR reporting is available on the radio; online at KGOU.org; on mobile apps NPR News and NPR One, TuneIn Radio, iHeart Radio and Apple News; through Facebook, Twitter and Instagram; and in your email inbox. Deeper. Broader. Farther. KGOU’s Wavelengths takes you a step beyond daily news coverage.